Houston's year-round warm temperatures and proximity to the Gulf of Mexico provide ample opportunity to escape to sand and salt water. Here are five of the best beaches to visit in the area that are just a short drive from the city. What this beach lacks in size it makes up for in charm. The sand is soft and clean, with plenty of space to set up tents and lawn chairs, play soccer or make some sand castles. A small parking lot and green area with picnic tables sit just a stone's throw away from the sand. The beach faces the bay—not the Gulf itself—so the waves are nice and low, and the water is shallow. Its proximity to Houston's port also gives visitors a view of the many barges and ships that pass through. Pro-tip: Parking is free but limited, so get there early on warm weekends to snag a spot. This bayside beach is located just 30 minutes east of downtown in the suburb of La Porte and has a lot of bells and whistles: showers, restrooms, parking, picnic areas, and even a playground. A long pier runs down the middle of the beach—visitors can go fishing off it for $4. It's this abundance of amenities combined with the soft, seaweed-free sand and small waves that make it a favorite among Houstonians. Families come from across the metro area to set up tents, umbrellas and portable grills and spend the whole day digging in the clean sand and splashing in the shallow water. While there are no lifeguards on duty, there is a line of floating markers to alert less experienced swimmers on where to stop when entering the water. Stewart Beach is the Cadillac of Houston-area beaches. 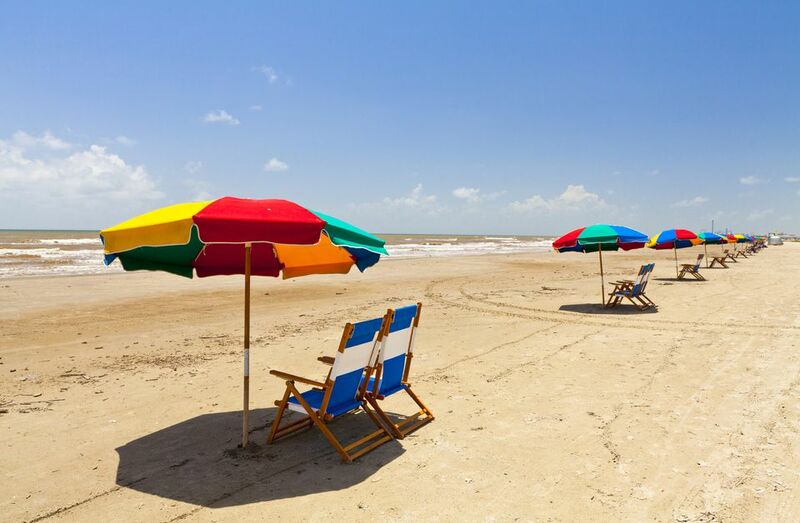 Located near Galveston Island's famous Seawall Boulevard, this beach has a laundry list of amenities, including showers, concessions, chair and umbrella rentals, and lifeguards. The beach is regularly combed, ensuring it stays trash- and seaweed-free, and there is ample space to lay a blanket down on the sand, even on the busiest of weekends. Beach wheelchairs are also available if you show a valid ID. The best part about Stewart Beach, however, is its proximity to Galveston's other great attractions. Moody Gardens, the Schlitterbahn water park, and a wide selection of bars and restaurants are all close by. Parking is $10–$15 if you want to drive up near the beach, but limited free parking is available just beyond the second entry point near the RV park if you don't mind a bit of a walk. Surfside Beach is about an hour's drive outside of Houston. With only about 500 residents, it's more of a village than a town. The entirety of it takes up about 2.5 square miles—most of which is pure coastline. Its namesake beach is wider and deeper than a lot of the area beaches, leaving plenty of room to lay out on the sand and play in the surf. The low, consistent waves make it a great spot for beginner surfers, and while the water isn't Caribbean clear, it's less murky than in other parts of the Gulf Coast. It doesn't have the amenities or attractions Galveston does, but it offers some definite perks. You can drive on the beach (with a purchased permit), have small bonfires—and even camp in some sections. At a two-hour drive outside the city, this expansive beach along Highway 87 and the Anahuac National Wildlife Refuge is a bit of a hike to get to. But it's absolutely worth it for those who want to escape the crowds. You won't find a shower or lifeguard here. In fact, you won't find much of anyone. Even on warm holiday weekends, there might only be a dozen or so people in view with plenty of space in between. Vehicles can turn off the highway and pull straight up onto the sand, and visitors can spread out as much as they'd like. It's a natural beach with no amenities, not even restrooms. The sand is rough and mingles with piles of seashells and dried seaweed. But for those who simply want to splash in the water or build giant sandcastles or sit on a chair with nothing but the sound of the waves crashing nearby—there's no better place to find it.